Emergency Medicine requires synthesizing large amounts of data in a short amount of time for multiple patients. Think of your last busy post-overnight sign-out, when multiple patient-care-plans needed to be safely communicated from one team to the other. Why are these handoffs so difficult for us? Is there some theory that may illuminate this phenomenon and provide ways to improve? Cognitive load theory (CLT) was initially developed in the 1980s from research in cognitive psychology that concluded that there are multiple elements that can overload the learner and reduce problem solving (1,4,7). Sensory memory encompasses brief visual and auditory inputs such as faces/colors/environments, but lasts only 1-2 seconds and generally does not reach consciousness. Long term memory is a permanent form of memory that utilizes meaningful connections between information elements, and thus can easily be recalled. Working memory is memory for operating a current task (4). Working memory holds information for a few seconds, with almost all information lost after about 20 seconds, unless the information is rehearsed (1). Working memory is limited and can hold no more than five to nine information elements (think of memorizing a phone number, ie. seven plus or minus two)(1). Working memory is critical to completing a successful handoff, but can easily be overwhelmed. Intrinsic load is the load associated with performing the task itself, such as communicating the names, comorbidities, and plans for the patients at signout. Extraneous load is the load associated with non-essential aspects of the task, such as what is happening in the environment at signout or what is happening in someone’s personal life that may be affecting the handoff. Germane load is the load to develop strategies to facilitate learning (3). In general, when the cognitive load associated with a task exceeds the learner’s working memory capacity, performance is impaired (3). Appreciating the limits of working memory can help identify the challenges of handoffs. One proposed framework for handoffs is to create a “shared mental model between the giver and receiver” (4). There are multiple factors that prevent the sender and receiver from developing the shared mental model, and this concept is explored through cognitive load theory. These factors can be analyzed by the type of cognitive load that they encompass: intrinsic, extrinsic, germane. So What Can We Do to Improve Working Memory and Create Good Handoffs? Intrinsic load is the load associated with performing the task, or in this case, the load associated with performing the process of a handoff itself. First, the number of information elements influences intrinsic load (4). For example, learning about five patients and their comorbidities during sign-out causes a greater load than two. In the Emergency Department, the number of patients that we must signout is difficult to control, but we could reduce this cognitive load by discharging individuals prior to signout and listing only the critical comorbidities for each patient. Second, the amount of time available for a task influences intrinsic load (4). For example, the need for rapid handoff and decision making consumes more working memory. Again, this is difficult to control in the Emergency Department, but allowing sufficient time for signout is key. A fourth determinant that influences intrinsic load is the experience of the learner (4). As expected, the intrinsic load of a handoff is reduced when learners are more advanced, as the advanced learner has well defined illness scripts that he or she can implement and not bog-down working memory. Again, this cognitive load is difficult to control in the Emergency Department, as we cannot age the learner, but it may be helpful to simply be aware that signing out to someone of different training level requires slightly different information to diminish cognitive load. Extraneous load is the load associated with non-essential aspects of the task. Extraneous load is influenced by three components: the physical environment, the personal environment, and how information is presented. First, the physical environment influences extraneous load during handoffs. It is difficult to control the physical environment and distractions of the ED, but having a culture of limiting interruptions during handoffs may decrease this load. Secondly, extraneous load is influenced by the personal environment. For example, personal distractions such as home life can increase extraneous load during handoffs. Included in this category is learner fatigue or “burnout,” which is a type of extraneous load that decreases working memory capacity and can affect handoffs (4). Focusing on wellness outside of work may limit this factor. Thirdly, how information is presented influences extraneous load. For example, when information necessary for the handoff is distributed in space (ie, requiring the sender and receiver to access multiple different databases for information), then extraneous load is increased. Thus, having a cohesive tracking board with all pertinent information in one place, as opposed to having to click through multiple screens for information, would decrease extraneous load during handoffs in the ED. Additionally, combining auditory and visual elements during signout decreases extraneous load. Germane load is associated with the load to develop strategies to facilitate learning. Strategies associated with optimizing germane load include asking clarifying questions and summarizing what has been heard. In the Emergency Department, encouraging clarifying questions during handoff would be a way to improve handoffs. Additionally, having the receiver give a summary to the sender at the end of signout, may also prove useful. 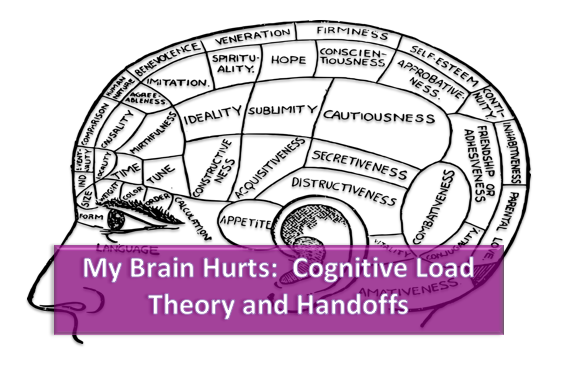 Cognitive load theory gives a framework for illuminating why handoffs can be challenging in the Emergency Department. We largely use working memory during handoffs, which is a limited and influenced by intrinsic, extrinsic, and germane cognitive loads. By implementing strategies to manage intrinsic load, reduce extraneous load, and optimize germane load, we can create more successful handoffs. Dr. Miller has done an excellent job of laying out the various factors at play contributing to cognitive load in the Emergency Department and specifically how these factors contribute to making sign-out such a potentially dangerous time. I want to highlight a few key reasons sign-out conveys such a critical mass of cognitive load and then emphasize some “hacks” to reduce the various contributing factors. A substantial amount of the critical mass is the product of the nature of the Emergency Department flow, from patient volume to case complexity. I often hear residents say at the beginning of each shift that they want to “work on efficiency.” I would challenge you to take that a step or two further and define the specific type of efficiency in light of considering the various aspects of cognitive load. Do you want to work on your ability to formulate an “if/then” dichotomous decision plan when you walk out of the room to expedite your discharge process? Do you want to further develop your illness scripts by seeing as many patients as possible and discussing where they fit into your bell curve to improve your pattern recognition? Thinking about the various aspects of cognitive load will greatly aid in defining where your efficiency bottlenecks are and how you can improve them, while also improving your knowledge, skills, and personal patient flow for future practice. Sign-out is the culmination of an entire shift’s worth of cognitive load. It combines both cognitive fatigue from seeing patients and making decisions with physical fatigue from long hours spent working hard and potentially not eating or using the restroom. Cognitive residue from issues outside of work or on cases from previous shifts that you feel could have gone better may also contribute to the cognitive load you experience, and all of this occurs while you try to distill complex patient cases from a crazy shift into concise presentations with understandable dichotomous decision trees for the oncoming team. I would like to emphasize a few of Dr. Miller’s key points here and add some tips with which I have had or seen significant success. 1. Be disposition-oriented at all times. If you consistently walk out of the room with a dichotomous decision pathway and know whether the patient will be discharged or admitted, you will have an easier time communicating a concise “if/then” plan to another provider backed up by your decision process. Consistently remaining in this mindset will keep you in “sign-out” mode, especially as you wrap up your shift. 2. Limit uncertainties (with the caveat that every patient should be reassessed). Providing the oncoming team with decision branch points such as “if the CT is negative, the patient can be discharged” or “this patient will need a sober re-evaluation in two hours at 9:00 AM” makes it easy for them to understand rate-limiting steps. It also allows for you to set time points for reevaluation, and if things are not following the dichotomous decision that was laid out, the receiving team should have a low threshold to take a step back and this should trigger the pursuit of a new pathway. 3. Find a system that works for you to reduce your cognitive load and use it! What do I mean by this? Take some of the load in your actual brain and put it into some form of external brain to reference as opposed to having to recall everything. Use old-fashioned paper and pencil with checkboxes for what needs to be done in your decision-tree or using electronic medical record hacks such as the notes section to come back to with the rate-limiting steps when you run your board. Using the EMR to communicate also has the added bonus of letting the nursing staff and others know what the rate-limiting steps for a given patient are and helps relieve some of the cognitive load off of your shoulders. 4. Have a shared mental model for sign-out such as the I-PASS system. The I-PASS system is a mnemonic that stands for conveying the illness severity (for example: stable, watcher, or unstable), patient summary, action items (dichotomous if/then plan), and situational awareness for potential pitfalls and contingency planning for the them. The final S stands for synthesis by the receiver, which can be done for each individual patient, for all patients signed out, or both. By telling the oncoming provider how sick you feel the patient is and their brief presenting history and relevant past history you paint a picture of the patient for the team taking over. Once they have a mental picture of the patient, you give them your dichotomous decision tree and areas where you could foresee this breaking down. Finally, the other team should run the board back after they receive sign-out and ask clarifying questions. This also allows you to get a fresh perspective on cases if you need it. This is the one time we get to really bounce things off one another as a team – take advantage of it! 5. Limit interruptions during handovers. Call the communication system to have them hold your phone calls. Have the other team take traumas and critical patients. Bring your charge nurse into sign-out to expedite workups and dispositions. Do sign-out where you can't hear each other. The key is to limit distractions that take up part of your attentional capacity so that you can efficiently communicate the status and plan for each patient without omitting any important details. 6. Finally, make sure you clear the deck and take care of yourself. Make sure you debrief difficult cases in real-time if you are able to in order to reduce the cognitive residue that this may contribute to the rest of your shift and sign-out. Additionally, make time to eat and use the bathroom on shift to reduce physical stress and improve cognitive processing by taking a short break every hour or two. This allows you to be at your full functional capacity and ensures you are giving your best to each patient and your colleagues once sign=out rolls around. As emergency physicians, cognitive load is everywhere and inherent to our job. How you deal with it will define your “efficiency” on shift and over a long career. Developing functional strategies to manage your cognitive load early will give you the tools you need to have a long and healthy career in emergency medicine. Van Merriënboer, Joroen JG, and Sweller, John. Cognitive load theory in health professional education: design principles and strategies. Medical Education. 2009 Dec; Vol 44, 85-93.16. Young JQ, Ten Cate O, O'Sullivan PS, Irby DM. Unpacking the Complexity of Patient Handoffs Through the Lens of Cognitive Load Theory. Teach Learn Med. 2016; 28(1):88-96.
. Patterson ES, Roth EM, Woods DD, Chow R, Gomes JO. Handoff strategies in settings with high consequences for failure: Lessons for health care operations. International Journal for Quality in Health Care. 2004; 162:125–32. Young JQ, O'Sullivan PS, Ruddick V, Irby DM, Ten Cate O. Improving handoffs curricula: Instructional techniques from cognitive load theory. Acad Med. 2017 Mar; DOI: 10.1097. Sweller, J . Cognitive load during problem solving: Effects on learning. Cognitive Science.1988 Jun;12 (2): 257–285. Paas, Fred G. W. C.; Van Merriënboer, Jeroen J. G. The efficiency of instructional conditions: An approach to combine mental effort and performance measures. Human Factors: the Journal of the Human Factors and Ergonomics Society. 1993. 35 (4): 737–743. Posted on October 30, 2017 by NUEM Blog and filed under Cognitive Theory and tagged handoffs i-pass cognitive load cognitive theory patient saftey signout.